In the first few weeks of Jacob Haish research, I've come across some pretty neat documents and photos. I'm going to post a "Find of the Week" every week just to share an interesting piece of history that I discover along the way. Check it out! On Saturday I visited the Joiner History Room and requested to see what they had regarding Jacob Haish. Files and files of photos and documents came out. Needless to say, I've asked for copies of....everything. I'll be sharing it all here very soon. Sue Breese of the Joiner History Room made me a copy of this photo so I'd have something while I wait for the other copies to be made. This photo is incredible. 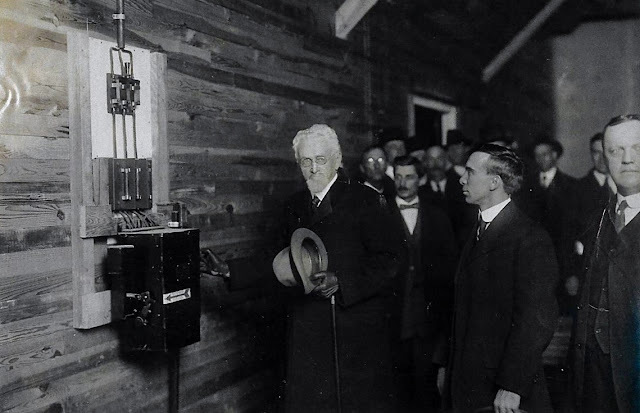 According to an Oct. 23, 1916 article of the Daily Chronicle, provided to me by Jeff Marshall, the photo illustrates Haish "throwing the switch" at the formal opening of Nehring Electrical Works. Throwing the switch would start the factory's machines, the article states. Haish would have been nearly 90 years old at the time of this photo, and the building had previously housed one of Haish's factories. Click the photo to enlarge and take a close look at Jacob Haish's cane, gloves, hat, and stern-looking face. Isn't history amazing? Special thanks to Sue Breese of the Joiner History Room for taking time to meet with me and fulfill a pretty large request.